This is Boracay! Proclaimed one of the best beach getaways in the world and a popular destination for many a Filipino celebrity. 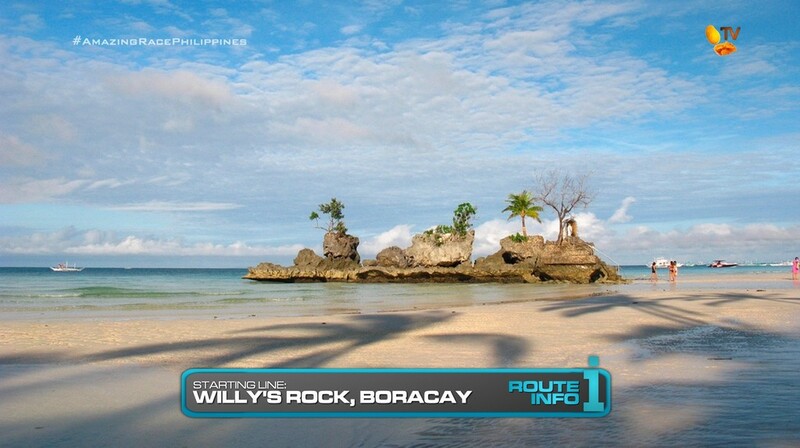 And speaking of celebrities, 12 celebrity teams are riding bicycles here to Willy’s Rock, the Starting Line for The Amazing Race Philippines. To get started on the Race, teams will need to spell out their first destination: Busan, South Korea. In the water around them are floating letters. 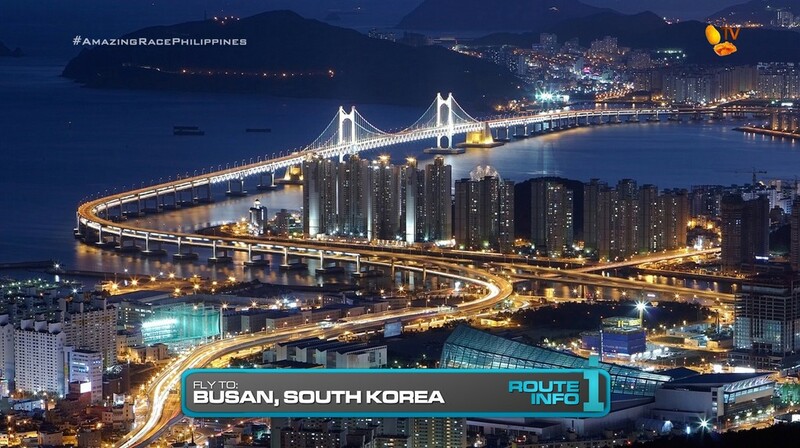 Teams will need to find the letters they need to spell out “Busan.” Once correct, teams will be given their first clue and their plane tickets on a direct Zest Air flight to Busan arriving at 6:50pm. All teams will be on the same flight. BUT! Finishing this task first has its advantages. The first four teams who complete the task will have their choice of either an Express Pass or a Super Yield. Teams also have the option of not accepting any of the gifts. 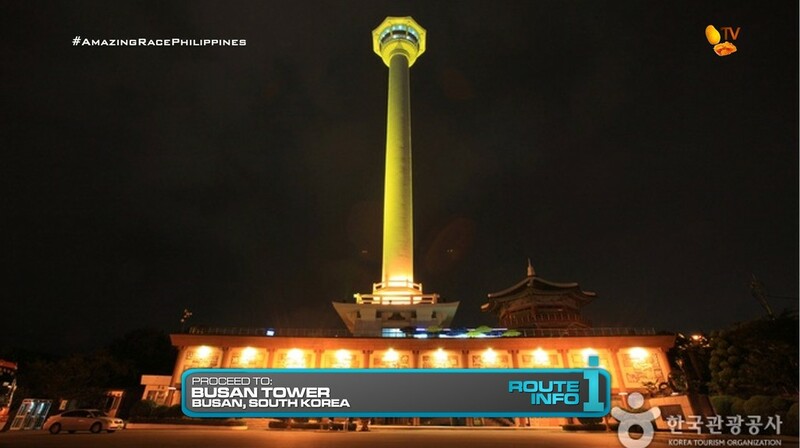 Once in Busan, teams must make their way to Busan Tower for their first clue. 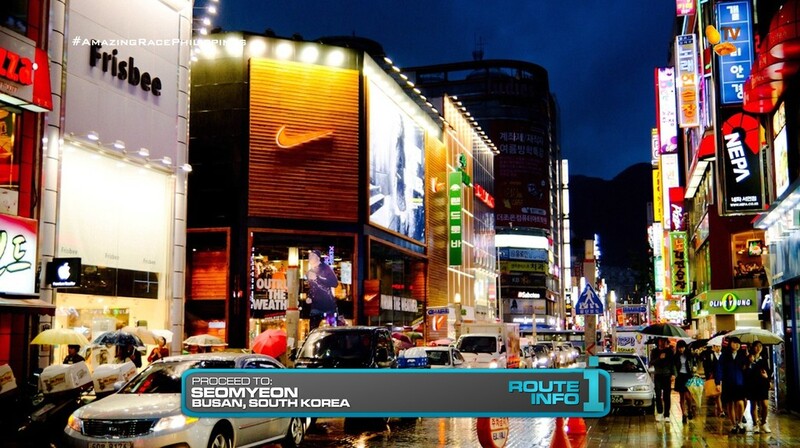 That clue will point teams to Busan’s shopping district of Somyeon. Here, teams will participate in a popular street game were they must hit a nail in a block of wood. Both team members must complete it. Men must do it in 5 hits, women must to do it 10 hits, as per rules. Once they’ve hit the nails, they’ll be given a departure time ticket for tomorrow morning, 6am, 6:20am and 6:40am. 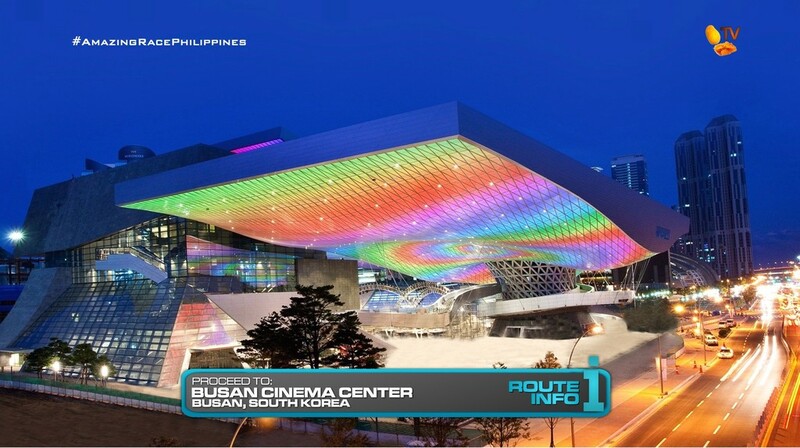 Teams must now make their way to the Busan Cinema Center. They must “search high and low” for their next clue. Teams must figure out that their next clue is on the LED ceiling of the complex in Korean (범어사) and in yellow and red. 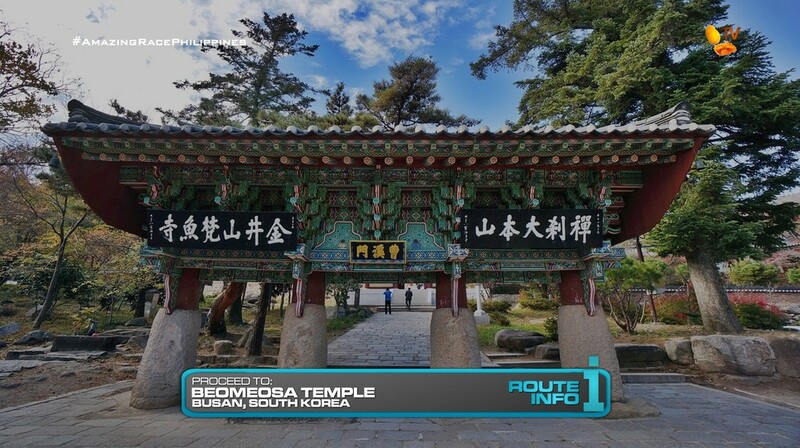 “범어사” is referring to Beomeosa Temple. Teams will be spending the night here. In the morning, a monk will guide them through a small ceremony where they will write their prayers on lanterns before being given their next clue at their departure time. 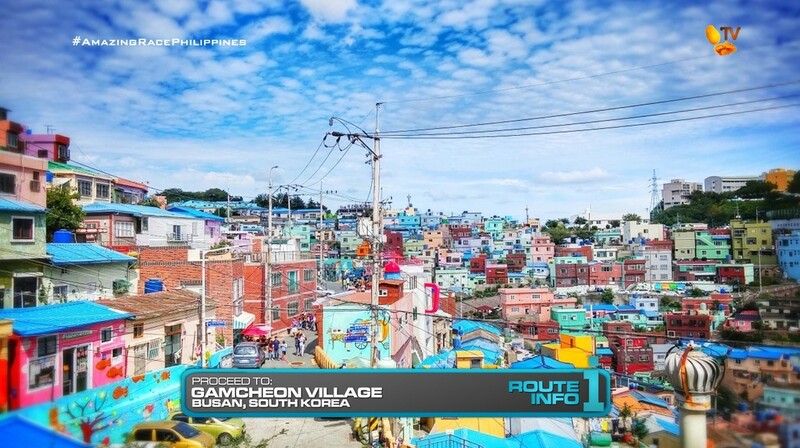 Teams must now make their way to the colorful Gamcheon Village. Teams must collect stamps from four different art installations in the area. They can exchange the filled out clue for their next one. That clue reveals the Detour: Load or Unload. 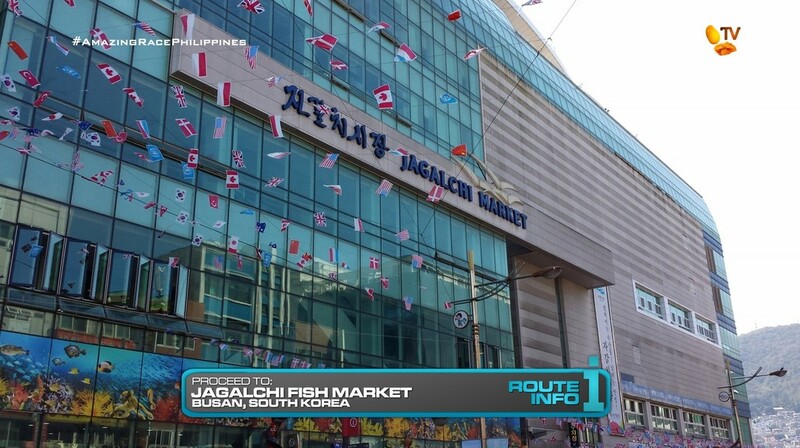 For both Detours, teams will make their way to the Jagalchi Fish Market by Nampo Port. In Load, teams will be given a list of various seafood, fresh and dried, which they must search the sprawling market for. The list will be in Korean. Once they’ve purchased the seafood using the money provided, they must carefully package the fish, including ice and deliver the cargo to a waiting fish truck. 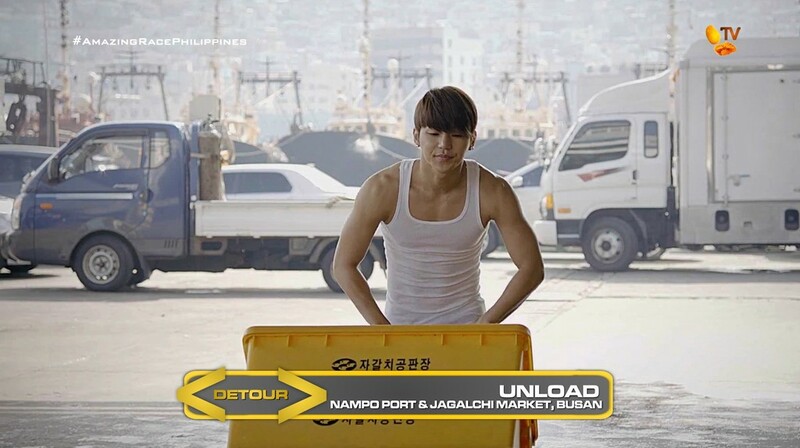 In Unload, teams must find a flagged boat at Nampo Port and pick-up crates of freshly caught fish which they must deliver to the correct stall at the Jagalchi Fish Market. Teams will deliver a total of ten crates and unload the fish onto the display in the stalls to receive their next clues. 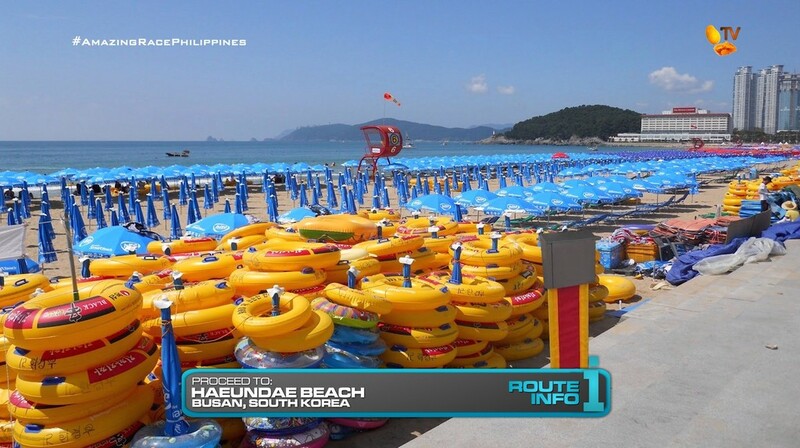 After completing the Detour, teams must make their way to the popular Haeundae Beach. 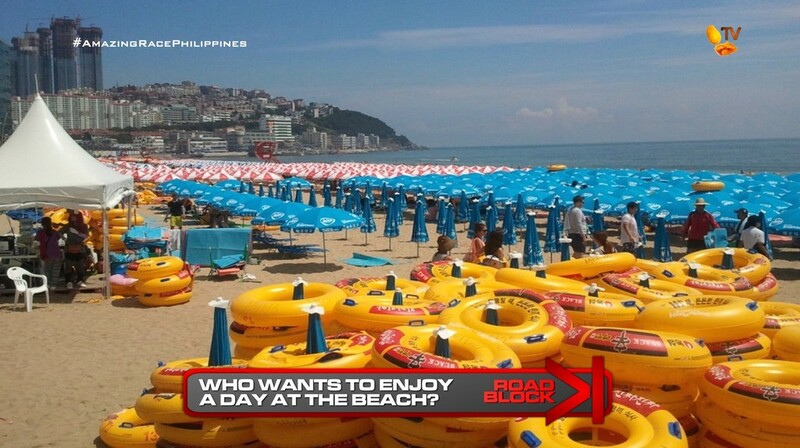 Here, teams will find the Road Block: Who wants to enjoy a day at the beach? For this Road Block, teams must first set up a grid of umbrellas on the beach according to the number attached to them. The umbrellas will reveal a certain Korean character. They will then need to search the water for the ten innertubes that are marked with the same Korean character and collect them. Once they’ve found all innertubes and placed them on the closed umbrella by the original grid, they will receive their next clue. 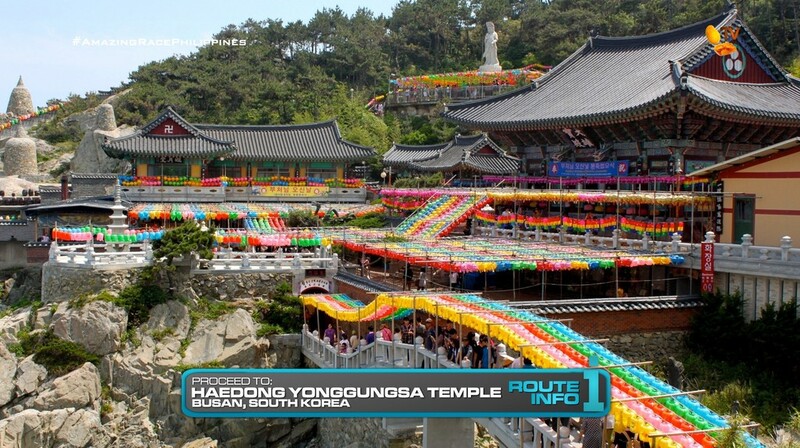 And that clue reveals the Pit Stop for this Leg of the Race: Haedong Yonggungsa Temple. The first team to check-in here will win P100,000 courtesy of Shell V-Power Nitro+ AND P100,000 for their chosen charity. The last team to check-in here WILL be eliminated. But they will also get P50,000 for a charity of their choice, also courtesy of Shell V-Power Nitro+. 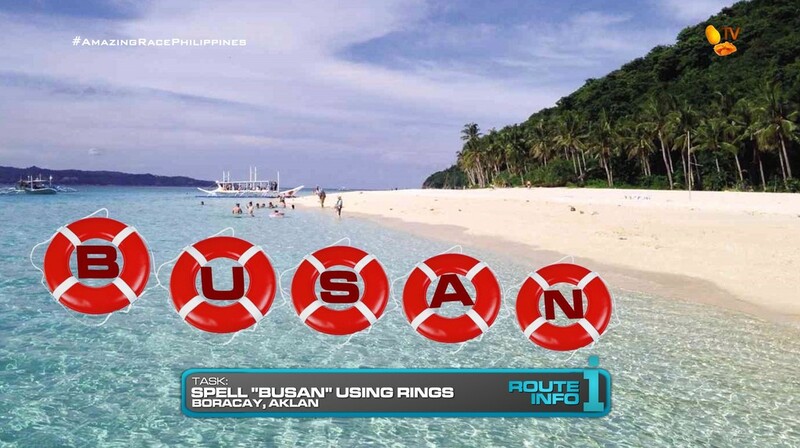 There’s a direct Aklan-Busan flight, so yay! We start with yet another Starting Line search task. Hopefully they find something else to do for season 8 (if there is one =D). The Seomyeon nail hammering is a touristy-kind of task. But it’s a way to dole out the departure times for the next morning. Also a good task for after dark. 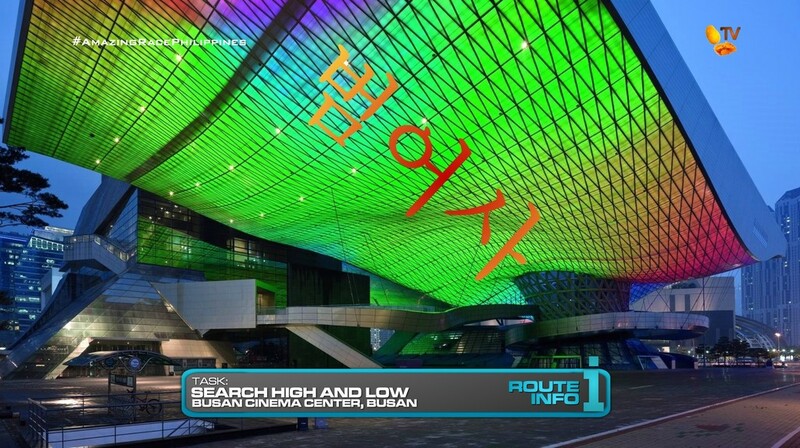 The Busan Cinema Center should look amazing at night (and in true HD!). I don’t know if the LED ceiling can project anything other than colors, but if they can, than this will be a nice little challenge. I originally wanted to have teams sleeping out on the beach or something, but I couldn’t find anything about that being allowed. If it is allowed, then the temple stay is unnecessary since it is out of the way. The Gamcheon Village task in the morning can easily be omitted. But it’s a visually interesting location with lots of local interaction. The Jagalchi Fish Market is a must for any Busan Leg. It might not seem like there’s a difference in the Detour tasks, but there is. 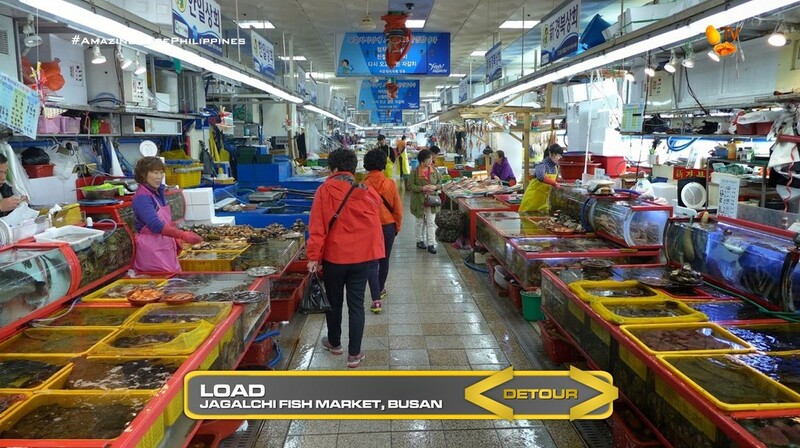 The Load side of the Detour may be more mentally challenging as teams need to search through the sprawling, multi-level market as well as the surrounding, outdoor market as well. Plus, they’ll still have to deliver too. For the Unload side of the Detour, it’s a straightforward task in a way because teams will be going from point A to point B the entire time. This will be a more physically demanding task. But it can also be made a little more challenging if teams have to handle live fish here from crate to crate. Haeundae is another touristy location. But it really is an iconic landmark of Busan. And with the lack of water tasks in the last season, I need to make up for it here. Hehe. A solid Leg that can be tightened up a little bit if needed.